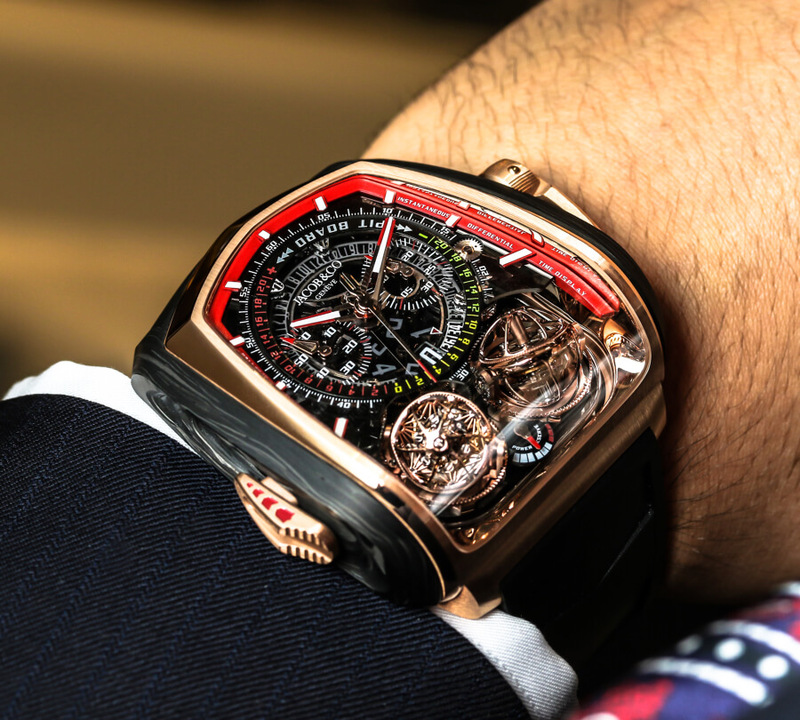 This Year at Baselworld, Jacob & Co. pushes the boundaries of traditional watchmaking with the introduction of its latest “grand complication” timepiece, the Twin Turbo Furious. The new model, which is an extension of the brand’s celebrated “Twin Turbo” line. 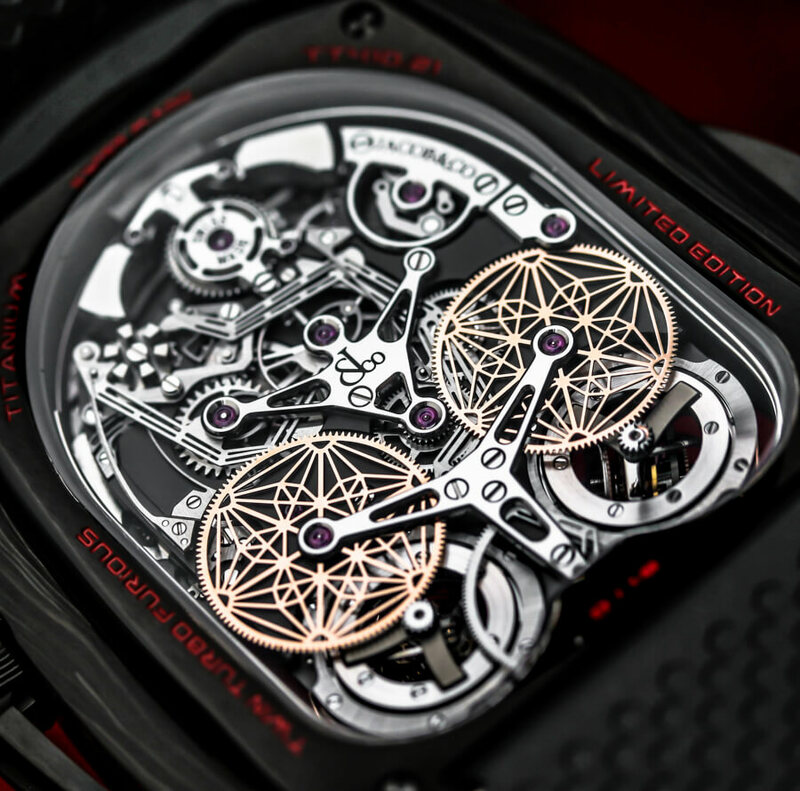 Destined to be an iconic piece, it boasts with an intricate combination of a twin accelerated triple axis sequential tourbillon, a minute repeater and a monopusher chronograph. In the world of watchmaking, the presence of a tourbillon in a watch’s movement renders the piece amongst the elite. Jacob & Co.’s Twin Turbo Furious sets itself apart from this distinguished lot, incorporating a twin accelerated triple axis sequential tourbillon into its striking design. The tourbillons fly their courses at a rhythm of one rotation in 24 seconds on the first axis, in 8 seconds on the second, and in 30 seconds on the third. 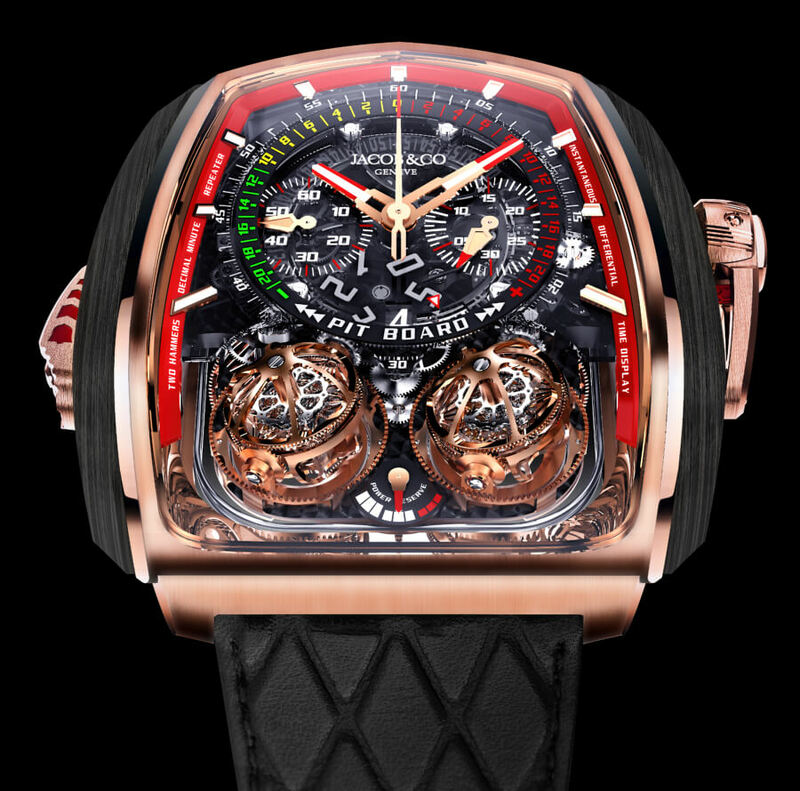 The tourbillon carrier housing the regulating organ thus sweeps over all the positions in half a minute and compensates the effects of gravitation due to the Earth’s attraction, considerably increasing the chronometric precision of the movement over time. This is a significant evolution from the watch’s previous version, which initially took 8 minutes to complete the sweeping over all positions. Today, the sweeping is done just 30 seconds – which speaks to the improvement in the stability of the new model’s precision. Given the rotation speed of the tourbillons, the balance wheel’s beat (to-and-fro motion of the pallet): 6 ticks per second – a fragmented and visually-powerful rhythm that earned the movement its sequential appellation, can be observed. 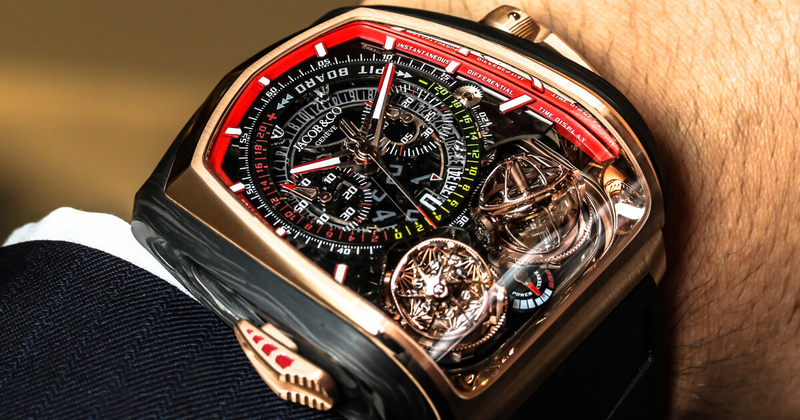 The benefit of the connection between the two tourbillon carriers is to stabilize the entire system. 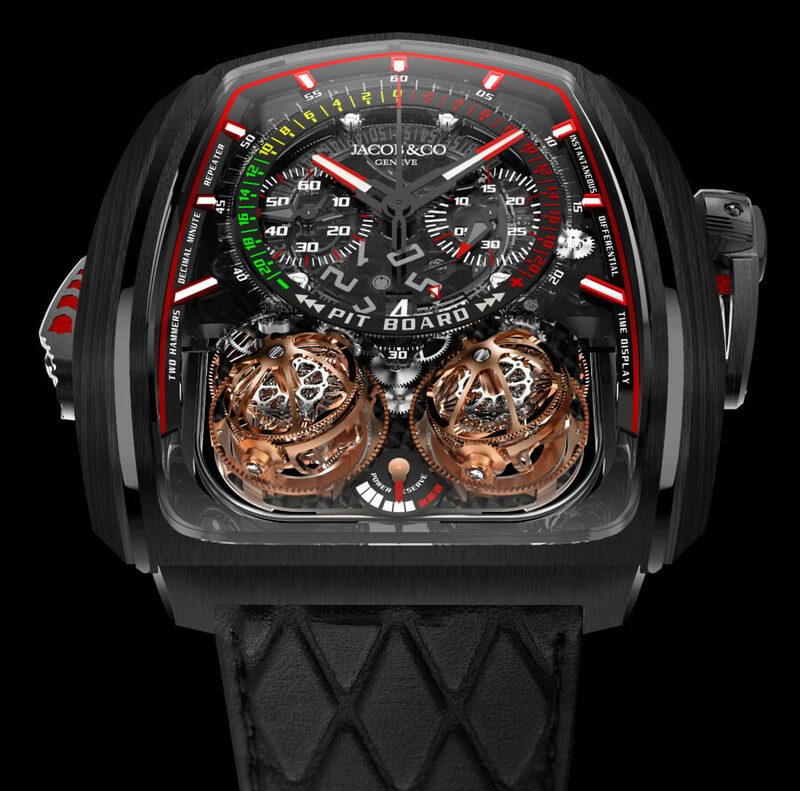 In case of impact, if either one of the two tourbillons were to be affected by the shock, the other would instantly compensate the potential discrepancy and maintain the movement’s perfect accuracy. Minute repeaters are amongst the complications that are the most prized by collectors. They are also amongst of the most difficult complications for watchmakers to conceive. Nevertheless, Jacob & Co. sought to push the boundaries of what was considered technically feasible when bringing the Twin Turbo Furious to life. In order to simplify the aural indication of time, the Twin Turbo Furious chimes every ten minutes. Because this type of mechanism is known to be sensitive, Jacob & Co.’s movement engineering department included safety devices to prevent untimely occurrences such as the chiming being activated when resetting the time. The power reserve is displayed on the dial side at 6 o’clock. Thanks to an ingenious planetary system comprising a differential gear mechanism; the hand points to a full power reserve on the left, then moves to the right as the 50 hours of reserve winds down. The watch is wound up through the crank placed on the crown at 3 o’clock. 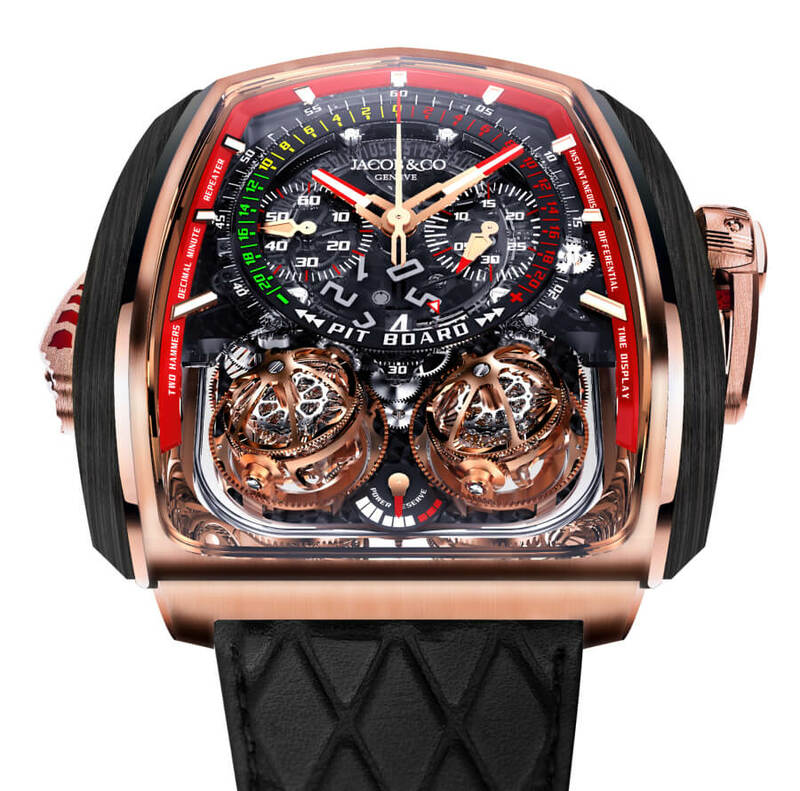 Jacob & Co.’s original Twin Turbo model, which debuted as a Baselworld novelty in 2016, was the first timepiece in history to combine two triple axis tourbillons and a minute repeater. With the Twin Turbo Furious, Jacob & Co. goes even further by adding a very specific chronograph function. Embodying the Swiss House’s determination to always seek new solutions or to create never-before-seen functions, the Twin Turbo Furious is equipped with a “reference time” indicator. The reference time indicator offers instant reading inspired by the timekeeping panels once used in motor racing; with each lap, the panels displayed on the side of the track would tell the drivers the time difference between their time and the lap reference time. 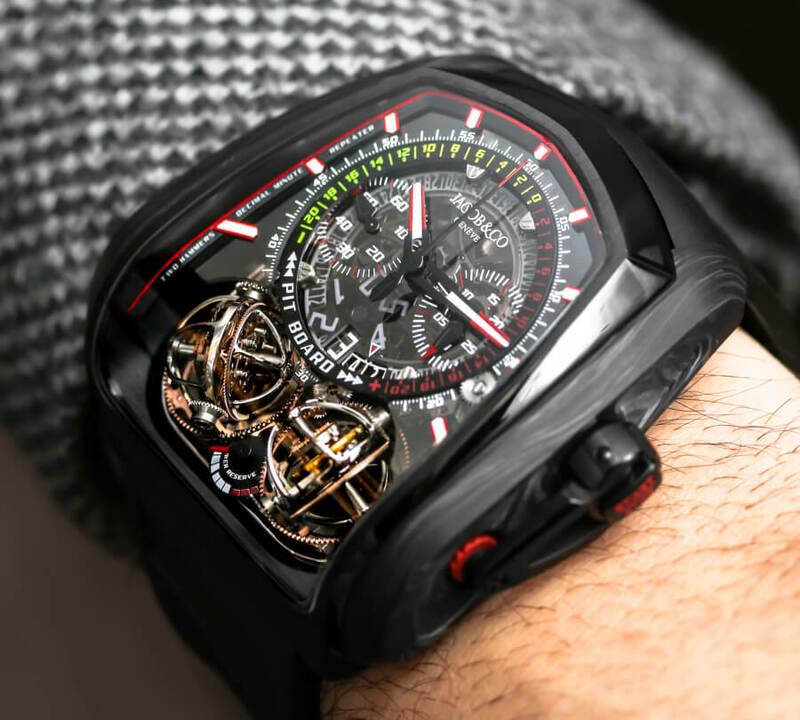 There is a display located on the center of the dial of the Twin Turbo Furious that indicates the difference in seconds in comparison to a reference time initially set by the chronograph’s hands. This solution, which is as esthetically-pleasing as it is technically efficient, will inevitably delight motor sports fans. The incorporation of the monopusher chronograph function in the Twin Turbo Furious was a priority for Jacob & Co.: a column-wheel and horizontal clutch ensure precise functioning while allowing smoothness in the controls. 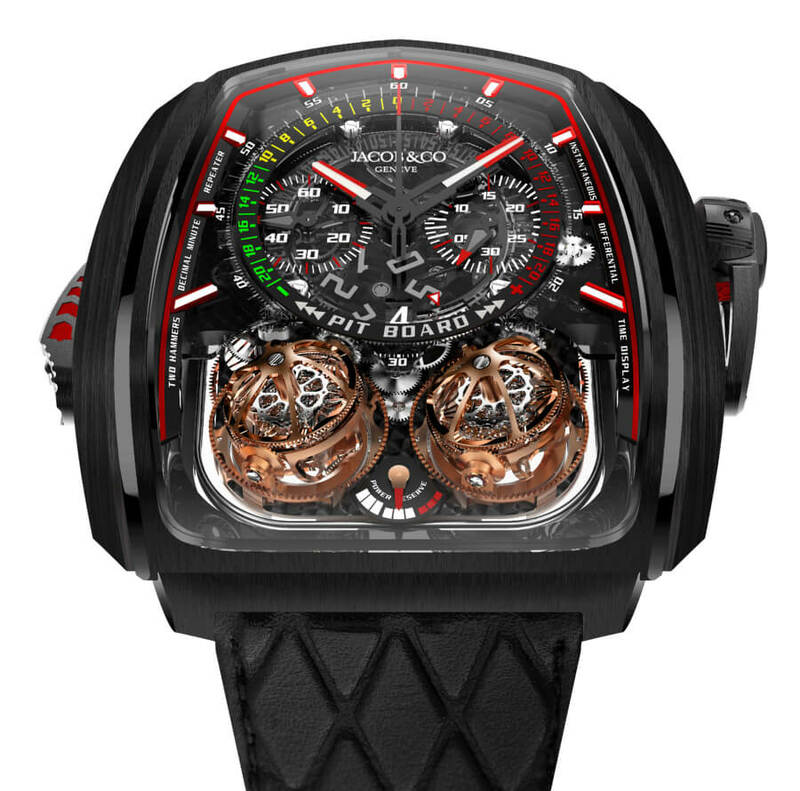 The price for the Jacob & Co. Twin Turbo Furious is CHF 525,000.